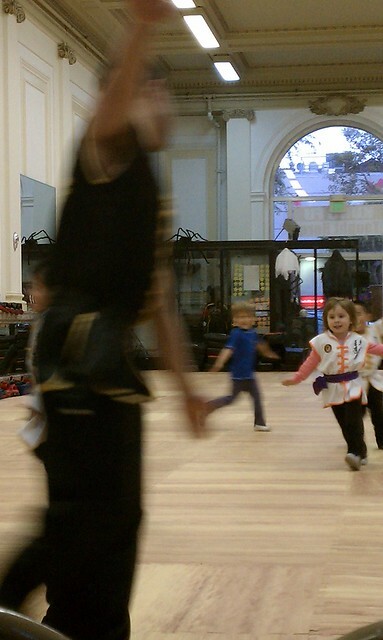 This weekend the San Francisco Opera had an open house with lots of activities for the community – especially kids! My papa and I went on a gorgeous day downtown. We got to see the old Opera House and walk around lots of parts of it. We saw the orchestra pit, the giant chandelier and even climbed up to the balcony level and watched as a chorus and orchestra made music to a packed room. 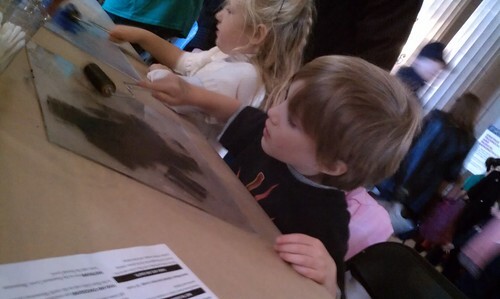 After we saw the inside of the Opera, we went to many of the artistic activities around the opera. We went to two different areas set up by the makeup team. Above, I’m working on a stamp tattoo. We also tried another kind of tattoo. 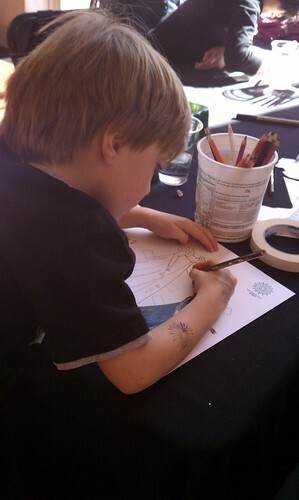 There was a lot of drawing activities too! I loved these! 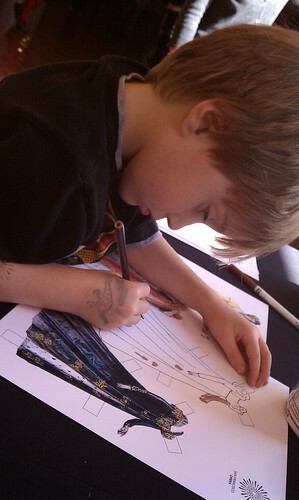 We got to draw dresses for Tosca and also color in a Swiss Guard. Papa and I had fun making these. I am glad that there are so many things to do in San Francisco! I had a great time at the Opera and hope that they do events like this again. For Halloween, I dressed up as a ninja. 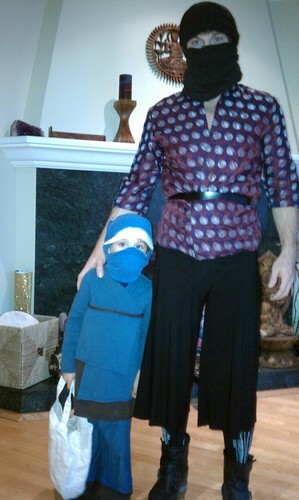 My papa helped me with a ninja hood and we dressed up together and went trick-or-treating in two different places. First, we went out in our neighborhood. We walked down the bustling Clement St and visited many shops that were handing out treats and goodies to kids. The shop keepers were very nice and happy to see us dressed up and coming by, even as it started to get foggy. We also went by the Kung Fu academy in the neighborhood. This is where I took a trial class and would like to study Kung Fu (check out my video and fundraiser for my classes on Indiegogo). And they were giving out a free week of Kung Fu! This is great since my fundraiser doesn’t wrap up for a while, it gives me a chance to get started sooner. After we got back, I counted the treats from our first outing and then we went to another place for trick-or-treating! 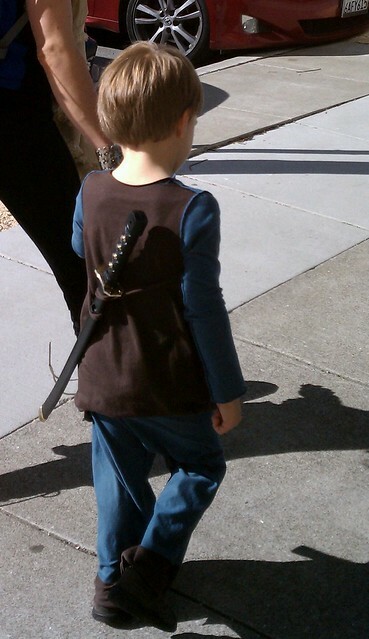 My friend Lucas was also a ninja for Halloween. 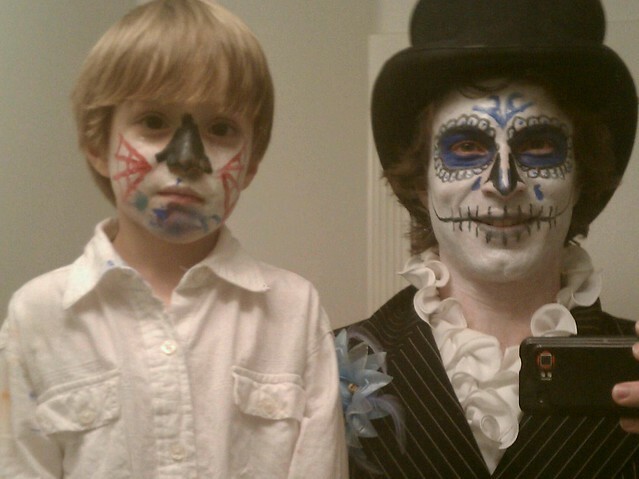 Papa and I went with Lucas’s family to another neighborhood and got LOTS more candy. It was also raining at this point so we also got wet! I came home and counted my candy again – this time up to 45 different pieces! I had fun sorting them by color and learning about what they are. On Saturday (Oct 6), I went off to a play date with my friend Lucas. We both love Ninjago stories and like drawing the ninjas, weapons and snakes we learn about. 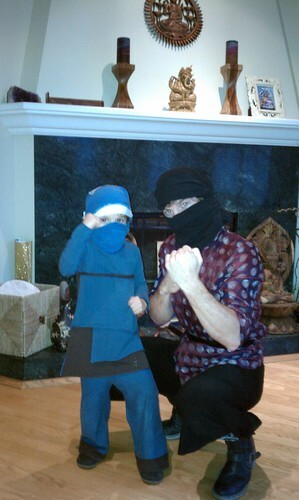 By the time Mama and Papa came to pick me up, Lucas and I had decided we both wanted to be ninjas for Halloween. To my surprise, Mama and Papa had brought a costume that is part of my ninja outfit! 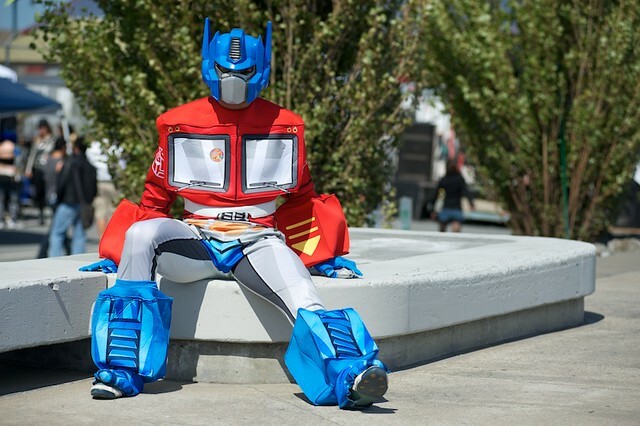 They took me to a street festival called Decompression and I got to wear my new costume. It was fun to run and play, to practice using the sword and to learn about how to use my sword safely. As part of the day, I also created my ninja name. My ninja name is Bayjitsu Spin. Each day we walk or bike to school, we pass a bunch of activity in San Francisco’s second Chinatown along Clement St. One place on the route is the Tat Wong Kung Fu Academy. Mama noticed my interest in Ninjas and asked if I wanted to check out Kung Fu. I went and got a private lesson to learn some basic moves and then was invited back to a class. At class, I joined other kids from a little smaller than me to a couple years older (and bigger). We warmed up with a follow the leader activity. Then we learned kicks, punches and positions for kung fu. I like how each move has a sound that goes along with it. Class is recommended 2 times per week for 5-6 months. I am hoping to get started on classes after my trip to Atlanta next week. so I can have a proper attitude for study. Papa asked me about my Kung Fu identity. I’m a Kung Fu Frog (that eats pollen and bananas!). One of my favorite things to do these days is draw. My parents tried to get me to do this a long time ago, but I just wasn’t interested then. But I have a new favorite group of characters that I love to draw! The characters are the ninjas of Ninjago. They all have weapons, cool costumes, and fight bad guys (mostly snakes). Each day I like to use pencils to draw colorful pictures of the ninjas, their spinning weapons, their badges, and the colorful bad-guy snakes. I use scissors to cut them out into individual pieces. 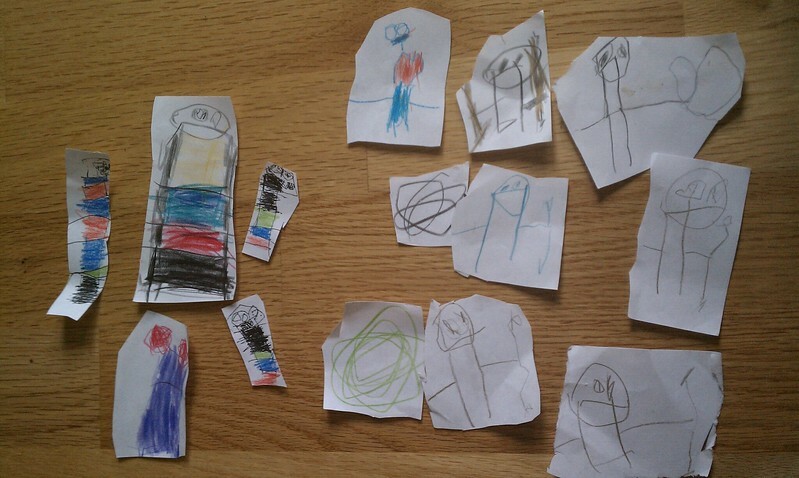 Papa and Mama help me carry them home from school when I make them there and we have a big collection (below is a picture of some of these). They have been so exciting that my Mama even got me a Ninjago book so I can see the characters better for help with my drawing! Thanks, Mama! Last weekend, my papa wanted to go to a festival called Art in Nature. It sounded OK, but I wasn’t too convinced. When we go there, we walked through the Dragon Gate to get into the festival. That was pretty cool. There were trails through the forest of redwood trees where people built temporary sculptures out of sticks, ice blocks and other materials. We had a snack in the forest and then walked a bit more. I found a slack line strung between two trees where I got to go and practice my balance. After that, I had another snack. And then we went to the playground! 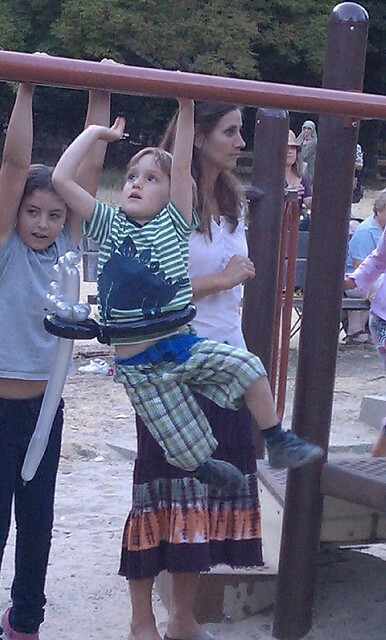 I love playgrounds, especially with equipment. I ran around and played and then my papa helped me with the monkey bars. I could only do two bars then. After the playground we went to look for o ther things that would be fun for me to do. And we found balloons! Nobody told me that there was going to be balloons! I love balloons. I stood in line with my papa until I finally got to the front of the line and met Magic Dante. He made amazing creatures for the other kids – a dragon, a goose, and a giraffe! He asked me what I wanted and I told him I wanted a sword! I got to pick the color and if it had a belt and he quickly made it for me. When it was done I was SO excited I could hardly stand it (I even let my papa take my picture!). The silver sword was just the right size for me and fit into a black belt. 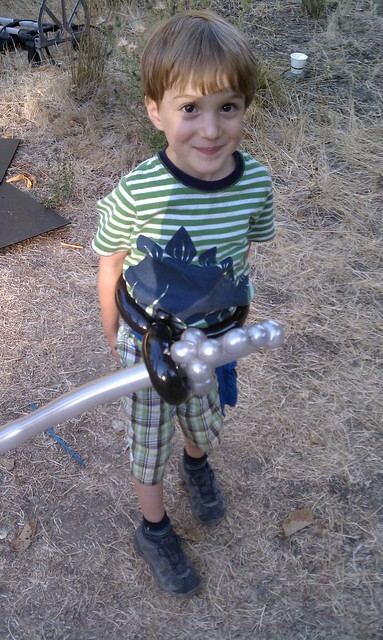 I headed back to the playground with my sword. This time when I went back to the playground, it felt different. I went and did the monkey bars all by myself. I made it part way across but I went back and did it again and again. And after a few tries, I made it all the way across by myself! I did the monkey bars many more times that day and I’ve even tried monkey bars at other parks since then. It feels great in my body to be able to do them all by myself. Like my papa, I’m a monkey! At first I was sad about being in San Francisco, since I don’t know many people. But my parents are helping me find new friends and take me on fun adventures! 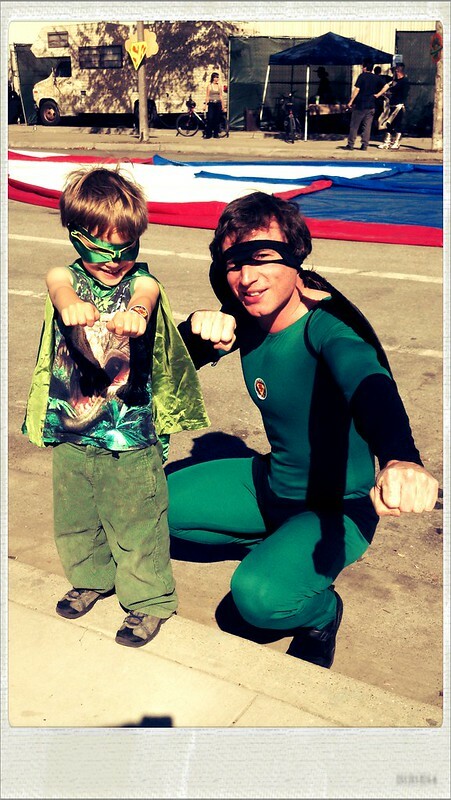 Last weekend, I went to the Superhero Street Fair. I’ve never seen so many superheroes in one place! It was really exciting. I saw robots, batman, catwoman, and all kinds of superheroes I’d never seen before! My papa and I went in green and used our super powers for good – vision, flying, seeing in the dark, and warding off people with cameras. We did let our friend Heather take one good picture of us using our super-powers. I was so excited to be at the fair that I was jumping up and down! 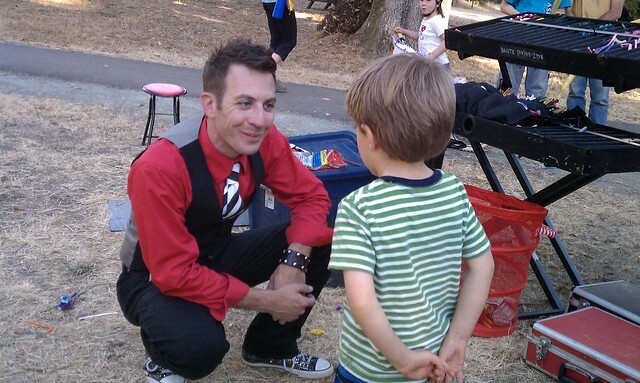 I can’t wait for the street fair to come back next year and to spend more time checking out the fun things to play on there! My family’s been busy lately and hasn’t blogged a lot. I’m now in school in California, my third year of Montessori education, and getting used to new friends, city, and parks here. As I get older, I’m also learning LOTS of new things! While it’s been a long time since updating stories here….we’re back! In coming to California, I learned about the importance of money to purchase things. I started to see things I wanted to buy plus wanted to understand how my parents got things in the world. My parents decided I was ready to start earning an allowance for doing my chores. It’s so exciting to be able to start getting money and using it! Each day I have responsibilities in the morning, in the afternoon, and before bed that help me keep my room and body clean. I also earn allowance for making my bed and for completing an enrichment activity each day. I was already used to keeping my room clean, brushing my teeth and the like, but now I’ve got the added incentive to do these things. I’m quickly learning and loving both the math and money lessons! I even used my own money to buy a toy I wanted. I worked with Papa to add up the bills and coins I had until I had the $5 to buy the toy. 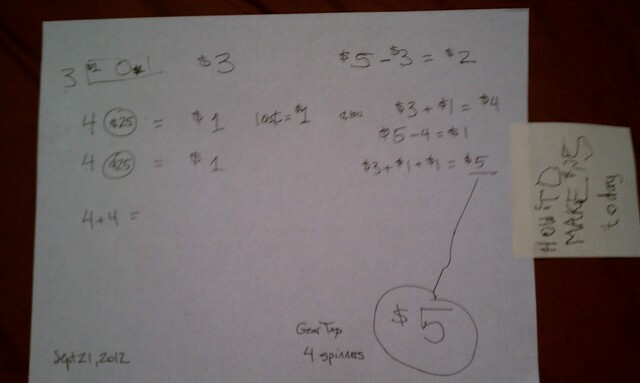 I was so excited that I wanted to mark the lesson (you can see where I wrote “How to make $5” with Papa’s help in the picture below). 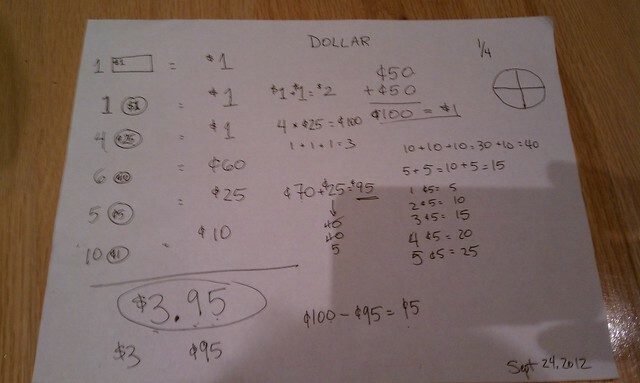 Later I used the same skills I practiced to make $5 to add up the money in my savings. This is great practice for me! Alon: He has been changing his clothes constantly lately. Jodi and I will go through his cubby to check and see of clothes are really dirty or if he was just ready for a wardrobe change. There may be a pair or two of shorts with a dirt mark in his cubby but we have been trying not to put them in his dirty bag if they aren’t truly dirty. As you already know, Alon is pretty much ready to start visiting primary. He is extremely independent these days. He is so busy in the classroom that I rarely give him lessons anymore. He is always in the middle of something and has been able to transfer a lot of his knowledge of the materials to the new materials I put out. I had given him a couple lessons on spooning and transferring and he just tears through those activities in the morning (I mean that in a good way). He shows a lot of concern for the maintenance of the room as well. He picks up after the younger children and will carry around materials that have been left out asking the other children if it was theirs. I know he had a rough couple weeks about a month ago but this is usually a sign that the child is about to have a developmental leap. Night waking is another sign of these advancements. He did really well with toileting this week. 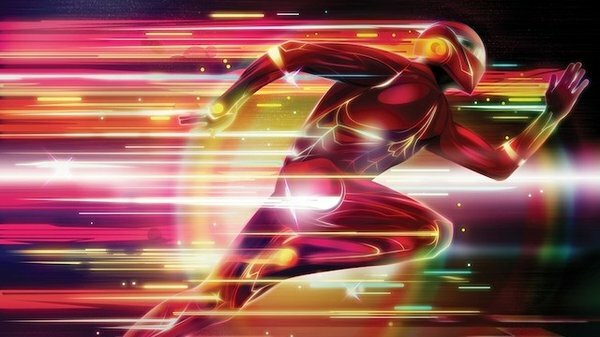 I saw him run to the toilet several times without informing me that he has to urinate. I can always tell that he has just gone to the bathroom because right afterwards he walks through the classroom adjusting his underwear and pants. He is also fiercely independent outdoors. He always has a shovel or some garden tool and is in the middle of a project. He absolutely loves to garden. I can tell you all include him in the gardening at home. Alon wants to be where the work is. He wants to “help mamma” or “Find papa, help papa”. He is active and if we do not get hime out of the house by 10:30 we are just asking for messes. He speaks in full, complete and well annunciated sentances “My pants are falling down” ” Mama is washing her hair”. He also comes up with pretty clever ways to use his relatively limeted vocabulary.